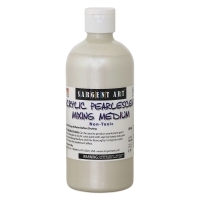 Produce pearlescent paint effects by mixing Pearlescent Mixing Medium with small amounts of acrylic paint. Create translucent matte effects by mixing Matte Medium with acrylic paint. Mix Gloss Medium with acrylic paint for a transparent Gloss finish. Mix with acrylic paint for a transparent Gloss finish. Permanent, water-resistant when dry, do not use as final glaze or varnish.